By the time we got back from the trek we were too tired. even for a massage, so we sold out and grabbed a pizza and watched a movie in bed. This was followed by a catch-up day – lots of internet and blogging for me while Claire did a few chores and nearly got caught up in a red shirt demonstration. We booked a massage course (following the guidance of Ross and Carrie – thanks guys!) and then to prepare ourselves went for our first Thai massage. It was fabulous – Enya on in the background, Seems that no matter where in the world you get a massage, Enya will be right there with you. The massage course began at 9 and we were joined by a French couple, Philippe, a composite materials technician who worked on the Eurpoean Space Programme Ariane missions and his Guyanese wife Olivia. A third pupil, Edouard, also French turned up an hour late, much to the displeasaure of Aree, our slightly deranged teacher. We started with the hands, back and face, all demonstrated by Aree while we took notes and then practiced on each other after lunch. The techniques were quite complicated but not undo-able and it felt good to be using our brains to learn again. In the meantime Songkran, Thai new year, was beginning outside. Kids with high capacity long range water pistols were lurking around corners and jumping out and soaking us at every possible opportunity. We went for a drink with the other pupils and all got completely soaked on the way to the bar. Luckily I had a plastic bag in which to put our notes but Edouard didn't. As our guest house was closer I ended up taking his soggy passport and notes back with me so they didn't get any more wet. He had Multiple Sclerosis diagnosed when he was about 18 and was in a wheelchair by the time he was 25. He turned his back on the western nuerologists looked into eastern medicine and was now wandering around SE Asia buying buddhist art with almost no symptoms. The second day of the course focussed on the legs – we spent about 90 minutes practising on each leg after looking over what we had done the previous day. It was incredible how much we covered in just 2 days. By the time we left we were both able to do a halfway decent full body massage. A great investment I think. The amount of water weaponry, including a new devastatingly effective one - a bucket filled with iced water, on the streets had increased so after the class we practically ran back to the guesthouse to protect our massage notes. It was Sunday and we had decided to return to the Sunday Market to buy some souvenirs and pressies – time for yet another package to be sent home. We bought an amazing amount of stuff – way more than we should have but hey. It had been our intention to get a steet massage too but we ran out of time. The evening was topped off by a few games of pool and a bar hop. Songkran officially started on the 13th April and even if you didn't know you'd find out as soon as you left the house. An overnight arms race had occurred. The kids' water pistols had been replaced by long range high capacity long range pump action water cannons. Marauding gangs of sodden teenagers drenched anyone and everyone with freezing cold water from bins on the back of pick up trucks. Every house, shop or bar had a hose or a bin filled with water to soak passers-by, whether they liked it or not. The epicentre for the madness was the moat. 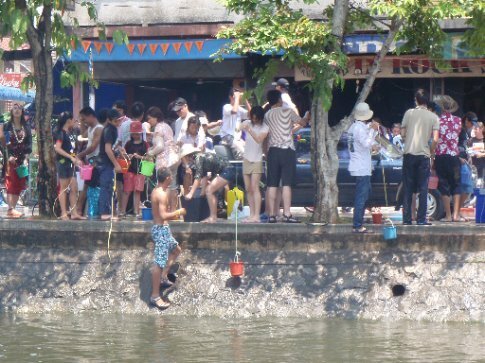 A permanent traffic jam on both sides (mostly of pick up trucks filled with dancing, shrieking locals indiscriminately water blasting everyone in range), bars blaring music, go-go girls gyrating, people in the moat itself, filling up buckets for the next attack. This was also where most of the falang (Westerners) were and it was interesting to note the difference between their approach and that of the locals. The locals would usually pour water over the shoulder, or squirt at the body, saying “Sawtdee Pi Mai” (Happy New Year) before moving on. Most of the Westerners however, the male gap year types anyway would take a military approach, having the biggest guns, aiming for the eyes and if you got one of them they would revenge squirt until they ran out of water. Kind of aggressive and while a lot of fun, we got tired of the moat after a few hours and made our way towards a temple to see what else was happening. The Sunday market never seemed to have shut down and a ceasefire prevailed where people were selling their wares. The ceasefire was often not observed by the aforementioned falang who were too drunk to notice. 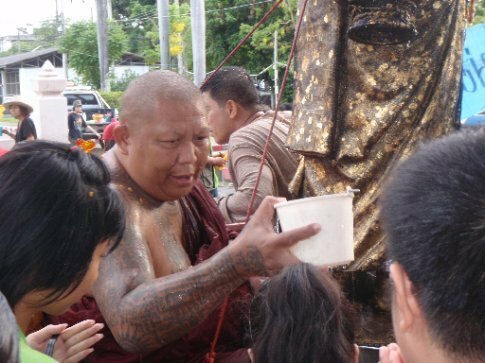 As we approached Wat Pra Sing, the most important temple in the city, a voice asked in an American accent Have the Buddhas returned yet?” I didn't know the answer but tantalized, asked “When did they leave?”. That was how we met Cara and Max, both from New York and having travelled widely in Asia were pretty knowledgeable about what was going on around us. I offered them a beer (always good to have a few tinnies in the backpack at a festival) and we sat down in the shade to find out why the Buddhas had gone and perhaps, when they would come back. 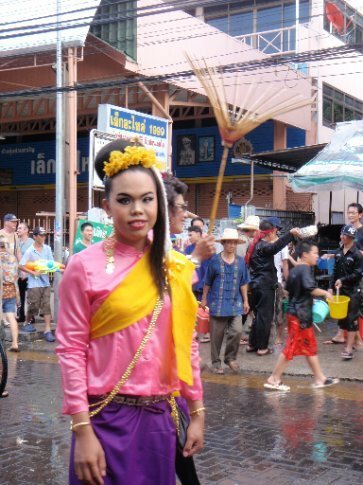 Songkran is about cleansing – new year, new beginnings etc. The most sacred Buddha images from each Wat are taken out on an all day prcoession through out the town, first meeting at the Wat Pra Sing and touring the town before returning back to the Wat Pra Sing and finally back to their own Wats. Throughout the procession people throw jasmine water over the images (and each other), to cleanse after the year's toils. This was the origin of the festival and over time it had been hijacked into the waterfight we witnessed at the moat. Eventually the emerald Buddha returned in an ornate carriage with an entourage of beautiful long nailed dancers, a gong troupe and a band of musicians playing quintessentially Asian music. We followed Buddha, and the throngs into the temple grounds. Buddha was taken carefully from the carriage and heaved onto its high pedestal where a crowd continued the jasmine water cleansing. Keen to join in we bought a few bottles from a monk and doused the statue. Buddhism is such an open religion – everyone can join in, no strings attached or questions asked. Making arrangements to meet Cara and Max later for dinner we entered the temple itself, passing around the bizarre dancing horse with an uncomfortable and sad looking boy hanging on rather than riding it. Inside ornate prayer flags adorned with Thai baht notes waved gently from the ceiling, offerings to deceased loved ones. All the flags were joined by string, each string joining another which lead eventually to a large groups of monks on the side, each holding a strand. The ceremony, which of course we didn't understand, involved the monks lighting candles, dripping the wax into their basins, tying and untying the string and slowly chanting at various points. One monk sat further back tying small pieces of string which people would reverently have tied around their wrists. It was beautiful and seemed much more participatory and accessible than Christian ceremonies despite the language barrier. As we left the Wat we noticed a discernible change. Water was back on the agenda, but this time it was old timers who would respectfully pour a silver bowl of jasmine water over your shoulder. Having put away our water pistols hours ago we now participated using a plastic pint glass – so much less aggressive than squirting your gun at someone. More Buddhas paraded by, all shapes and sizes so we did what the locals did and refilled our cups from the jasmine water run off and cleansed the next one to come along. About a million times more pleasant than the moat madness. 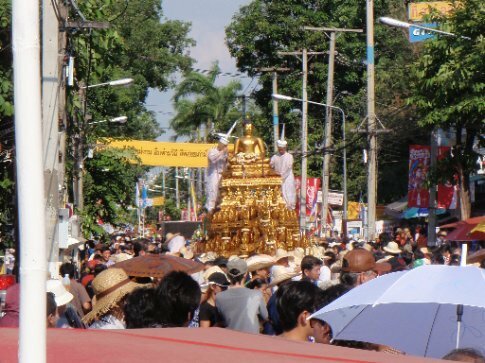 After the buddhas had passed the various town groupings paraded by, all soaked and smiling. Dentists, engineers, nurses, even the ladyboys glammed themselves up and puffed out their (fake) chests. Even the police, on duty got into the spirit of things. After dinner with Max and Cara we wandered about, chancing upon an open air Miss Chiang Mai competition. We did sweepstakes on who we thought would win but deliberations took an age and we left without knowing who would take up the mantle. Back to the rooftop chill out bar THC for a few drinks and a lot of fun – lots of characters in various stages of inebriation about, all in the lotus position chatting and comparing dreadlocks and woven bracelets. Suffering from hangovers we emerged slightly less enthusiastic about Songkran the next day. Our first soaking was an ice cold bucket from behind which didn't help. We learnt that if you don't display any water weapon you might just get away with it. If you stay in the Sois (lanes). But the moat was carnage again. After some hangover food we tried looking for a massage but couldn't find somewhere open. We bumped into Edouard from the massage course and hung out with him for a few hours, trying to avoid the wars. An early night followed and we were amazed and dismayed to hear that the situation in Bangkok had become so volatile. The ASEAN conference in Pattaya had been cancelled due to unrest and riots were happening in the city, where we had passed by a few times. When we turned on our phones we got texts from the FCO telling us about the state of emergency. All the same, all everyone was doing in Chiang Mai was having a good time. Then suddenly it was the last day of Songkran and we had to leave the next day. It didn't seem like 2 weeks had passed. We had a few important things to do – namely get boxes and find someone who would get them home for us. I wasn't looking forward to attempting this and keeping everything wet in the water festival but it had to be done. We found a place near enough to the guesthouse and managed to get the boxes back without being soaked and got mostly packed up. Still not totally in the mood for another day of soaked chafing we managed to well up some enthusiasm and do it all again – when else would we be able to? After doing the moat things for a few hours we ate a tasty papaya salad (declining the tiny crushed crabs) and started heading back. A procession of people in vague uniforms, drinking, dancing and drumming their way across the town passed by and grabbed us, inviting us to join them. We did. They were great fun, taught us a few dances and were generally very pleasant, The only problem was that we had no idea where we were going (apart from away from the centre). A woman presented us with some flowers at one point, for no apparent reason. We bought a few little garlands and some beers and carried on. After about 2 hours we ended up at a large mansion in the suburbs, with a few marquees around the gardens. We kept following the group who all started to throng around the front steps of the house where a middle aged couple were accepting offerings. Could it be the King and Queen? It certainly looked like them. We took our places at the back of the crowd and approached, discussing what to do when we got there. I wanted to give them flowers we had been given but Claire wanted to give them the garlands as that was what everyone else was doing. That made more sense so we went with her plan. 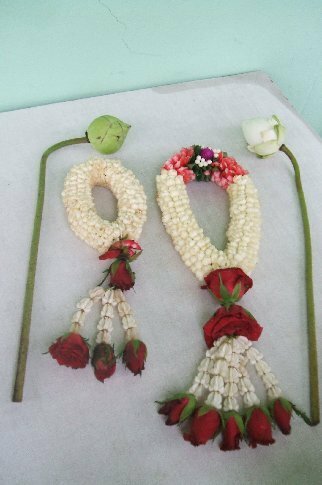 I went to who I thought was the King and giving him my garland, said the only thing I could: sawadee pi mai! he in turn presented me with a beautiful arrangement of flowers and wished me, in perfect English, the very best of luck in this new year and thank you for visiting. Claire received a bigger, even more beautiful arrangement. Looking around, it seems as this was a great honour as no-one else we could see had received anything and we got a lot of looks ... not jealous or nasty, just looks that said “well would you look at them with their flowers!” We found out it was actually Amonphan Nimanan, the governer of Chiang Mai and his wife, not the King and Queen but that did not take from the experience one little bit. We went home elated – delighted once again to have found the “real” festival.